What Are The Best Kitchen Scales On The UK Market? The secret to most recipes, especially when it comes to baking, is following the cooking instructions to a tee. Unless you a MasterChef who can eyeball 4 grams of salt or 300ml of milk guesswork will ruin most of your recipes. That’s why it’s important to have kitchen scales handy on the counter. They make food preparation easy and accurate. There are three types of scales: traditional balance scales (hard to find nowadays), mechanical scales which require no batteries and the extremely precise digital scales which are the most popular type. 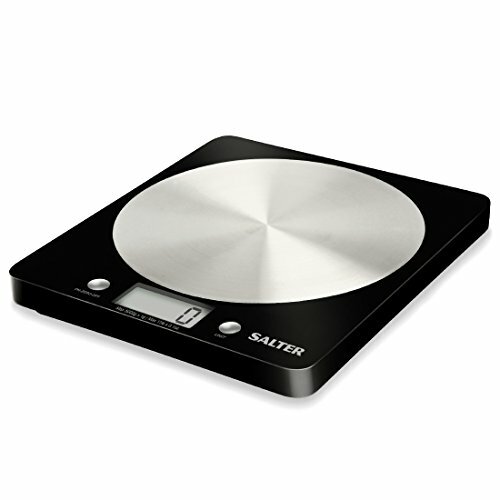 In this buying guide, we are going to review the best kitchen scales available online. We picked scales that are easy to use, provide some versatility when it comes to metrics and are guaranteed to last long. But first, here are a few things to keep in mind when you are shopping for a new set of kitchen scales. As I mentioned, there are three types of scales: balance scales, mechanical scales and digital scales. Balance scales are rare nowadays and you’d probably not want to use them anyway (they are tedious to use and not very precise). Mechanical scales use a spring to measure the weight of ingredients. They usually have a higher weight capacity than other types of scales. The main advantage of mechanical scales is that they don’t need a battery. On the downside, they tend to get less accurate with time as the spring mechanism wears out. They are also not as versatile as digital scales. For instance, most cannot measure volume which a lot of digital scales can. The best types of kitchen scales are digital scales. They are compact, very precise (especially for tiny measurements which are common in the kitchen) and easy to use. Digital scales display measurements on an LCD display. Make sure the display is large and easy to read. You shouldn’t have to bend down to see the digits. If you have poor eyesight, look for scales with a backlit display. It will be easier to use especially at night. Check the max weight capacity of the scale. 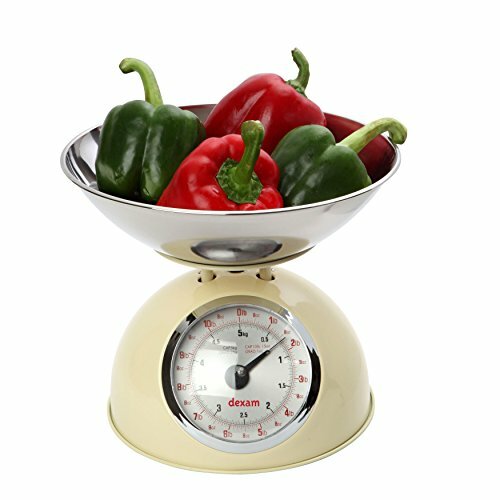 Most scales go up to 5kg which is adequate for most of your kitchen needs. A conversion button let you easily change between metric and imperial metrics instead of trying to convert measurements in your head. This is handy if you are following a recipe with different measurements than the ones you are used to. If you are using mechanical scales, they should have at least two sets of calibrations on the dial. A tare or ‘add & weigh’ function allows continuous weighing without having to remove the current ingredients from the scale. You simply press a button to reset the scale to zero and then you can get precise measurements for any new ingredients you add. This is really handy when you are mixing ingredients in a bowl on the scale. Some scales come with a simple platform where you place any ingredients you want to measure. Others have a measuring bowl where you can add and measure ingredients. But even if you get a scale with just the platform, you can always use your own bowl. Just make sure it’s lightweight and not wider than the scale. Other factors to keep in mind include ease of cleaning, low battery indicator, water resistance, non-slip base and durability. This affordable set of digital kitchen scales is versatile enough to cover all your weighing needs. It can measure both dry and liquid ingredients. For the dry ingredients, you have the option of measuring in kg or lbs. For liquids, it offers an option between litres and fluid ounces. The measurements are displayed on an easy to read LCD screen. The buttons for changing the metrics are located beside the display where they are easy to reach. One of the buttons resets the scale to zero without having to clear the platform. This is great when you need to mix several ingredients. 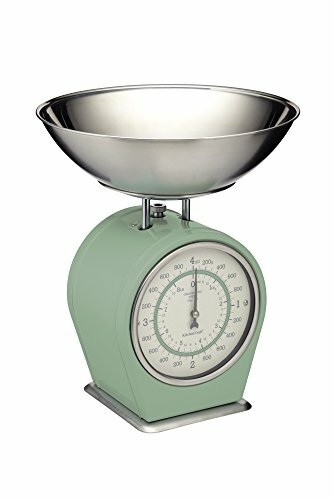 Talking of mixing, these scales come with a large 2-litre bowl. The bowl has a thoughtful dual pour design that makes it easier to transfer liquid ingredients without making a mess. Versatile metrics and tare function. Includes bowl for mixing and liquid ingredients. If you prefer the classic look and design of a mechanical scale, this one is for you. The scales are available in several charming colours including English Sage, Vintage Blue and French Grey. They look amazing in any kitchen. The stainless steel mixing bowl at the top completes their look. Beyond the design, these scales are quite practical to use. They have a max weight capacity of 4kg or 8lbs, which is more than enough for most people’s needs. The removable bowl is handy for mixing ingredients especially where liquids are involved. The bowl is dishwasher safe. While there isn’t a button for converting metrics like in digital scales, the vintage dial has dual kg and lbs scales. The main kg scale is divided into 200g increments. Each 200g is broken down further into ten 20g increments. 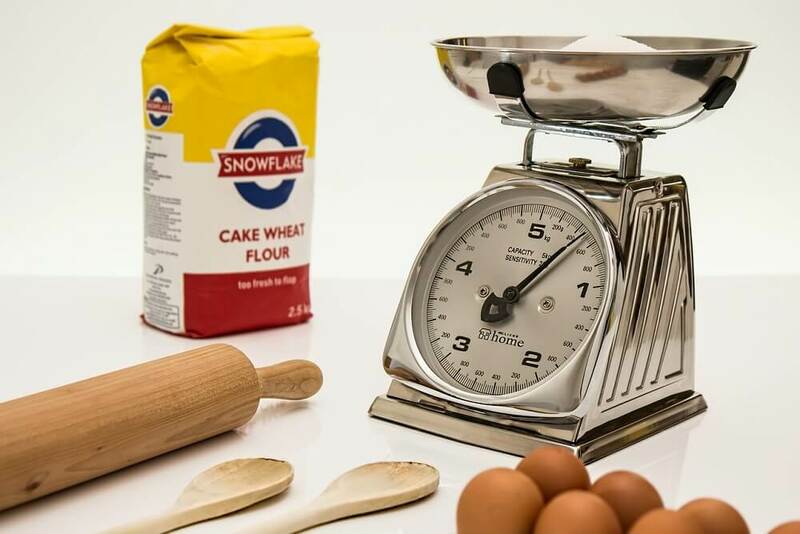 This provides precise measurements even for small ingredients. If the dial seems out of whack, there is an adjustment dial to re-calibrate the measuring mechanism. Beautiful nostalgic design available in several colours. Measurements in kilograms and pounds. Robust and long lasting construction. If you do a lot of baking or most of your recipes involve mixing different ingredients, these are the best scales for you. 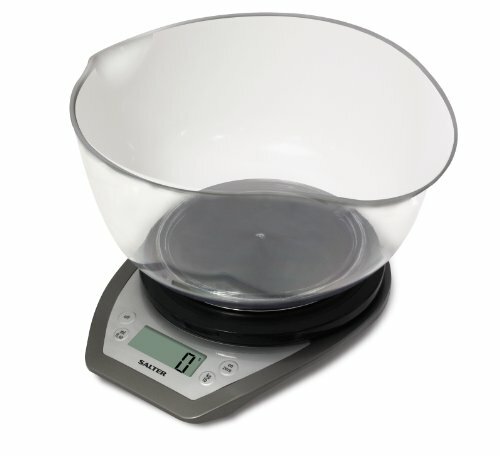 The scales themselves are designed in form of a jug with a removable bowl that locks in with a quick click. This design makes it very easy to add, measure and mix different ingredients – both solids and liquids. The scales come with a handle on which the LCD display is integrated, to make it easy to pour out ingredients when you are done mixing. The scale can display weight in either kilograms (max 5kg) or lbs and volume in ml (max 1,500ml) or cups. It’s easy to convert from one measurement to another. It also has a tare function which is handy when you are mixing ingredients. It allows you to reset the scale to zero before adding another ingredient. The main complaint many customers have is that the display is quite low and not backlit. So you have to bend down to see the weight or volume of whatever you are measuring. Convenient design for bakers who do a lot of mixing. Versatile measurements and easy conversion between different units. Removable bowl for easy washing. Add & weigh function for weighing multiple ingredients. This is one of the most popular sets of digital kitchen scales on Amazon. People love its slim compact design, easy-to-use buttons and display, dead on accuracy and years-long reliability. One of the things I like most about it is the versatility of measurements. It can measure your ingredients in various units including kg (5kgs max), lbs (11lbs max), litres (5L max) and fluid ounces (175 fl. oz. max). Changing from one unit to another is super easy. You can also take advantage of the tare function when you are mixing ingredients in a bowl. Just press the ZERO button and the display resets to zero before you add a new ingredient. The display itself is large and easy to read. There’s no need to keep bending down to see the numbers. From what customers say, you’ll be using these scales for years. And unlike mechanical scales, these ones don’t lose their accuracy with time. Measuring platform fits most bowl sizes. Ability to switch between metric and imperial measurements. Tare function is also included. Another good option if you are looking for retro-designed mechanical scales. 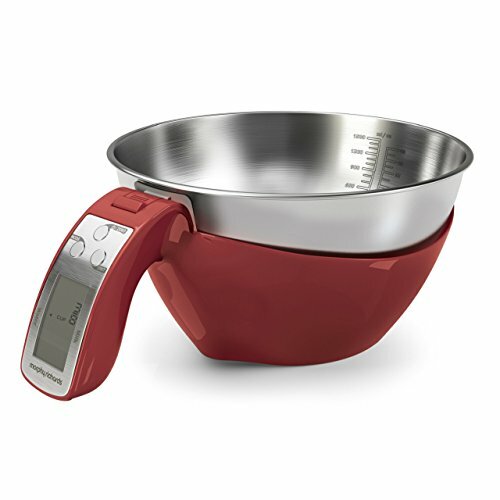 They come with a large dial display at the front and a removable bowl on top for measuring and mixing ingredients. The dial displays measurements in both kg and lbs, giving you an easy way to measure your ingredients in either. You can also measure in ounces which is handy for light ingredients. Even though the scales are mechanical, they still have a useful add & weigh function. But instead of a ZERO button like the one found in digital scales, you manually adjust the dial to zero before adding another ingredient. The 2L bowl is large enough for all your mixing needs. To transfer ingredients or clean it, you simply lift it off the scale. When in use, the scales sit firmly on the working surface ensuring you get accurate measurements every time. Beautiful retro design – great for those who are nostalgic about traditional mechanical scales. Large display with easy-to-see measurements in kg, lbs and ounces. Zero positioning function using the manual adjustment – great for measuring multiple ingredients in the same bowl.